When we think of dry, cracked feet, we tend to think of the physical, visual condition and not medical conditions that can occur to them if not properly treated. Left untreated, dry, cracked feet can result in deep fissures that make them not only horribly painful to walk or stand on, but in some cases, bleeding and infections can occur. 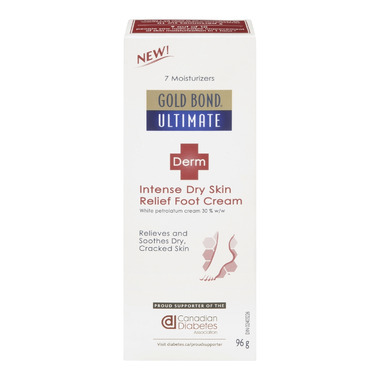 Gold Bond Ultimate Derm Intense Dry Skin Relief Foot Cream is specially formulated to help heal and prevent extremely dry, rough feet and heels before they become unhealthy. So your feet won't just look better, they'll feel better. With new Gold Bond Ultimate Derm Intense Dry Skin Relief Foot Cream, you can relieve your dry, cracked, calloused heels and feet in no time. Gold Bond Ultimate Derm Intense Dry Skin Relief Foot Cream has a unique blend of Hydralast emollients and humectants that draw moisture throughout the day, for 24-hour moisturization. Vitamins A, C and E along with moisturizing aloe nourish the skin, replenish skin's moisture barrier and soothe dry skin. Gold Bond Skin Protectant Foot Cream's active ingredient helps soothe and protect skin while sealing in moisture. This rich foot cream formula is non-irritating, hypoallergenic, fragrance free, dye free and perfect for daily use. Dermatologist tested among people living with diabetes, it is proven to provide relief to dry skin. Ideal for dry, cracked and calloused feet and heals. Directions: Apply generously to affected area as needed. Absorbs quickly and leaves feet feeling moisturized without being greasy. Is quite expensive though and you go through a tube pretty quickly. There are cheaper options out there. Comparable to any other thick petroleum based moisturizers. Not worth the high price for what it is. Might as well get something natural for the kind of money and it would do the exact same thing.